Computer simulations of hurricane lightning could be the key to predicting and avoiding the storms' real-world punch. Jon Reisner is building the biggest, meanest hurricane model he can, one that grows over the sea from a relatively weak category 1 to a crushing, city-swamping category 5 by the time it makes landfall. He wants everything a hurricane has to offer, from violent, convective updrafts that turn vast quantities of tropical water vapor into ice, to the massive vortex’s swirling eye wall. Most of all, though, he wants lightning. Because it’s these flashes, atmospheric scientists believe, that could be sending an early-warning signal that a hurricane is turning from mean to a monster. Since the devastation wrought by Hurricane Katrina in 2005 – the costliest and one of the deadliest natural disasters in United States history – Reisner is part of a groundswell of researchers using new observations and models to turn hurricane intensity forecasting into a solid predictive science. At Los Alamos, Reisner’s team led the creation of a three-dimensional model of hurricane lightning activity to test a hypothesis that many atmospheric scientists think holds the key to prediction: that the rate of a tropical storm’s electric flashes are a signal it’s growing stronger. There’s good reason to think this might be the case. Lightning is a proxy for what we can’t see that’s at the heart of a hurricane’s power. Although Reisner cautions that there are “lots of theories” to describe exactly how and why lightning occurs in hurricanes, it all comes down to a violent mix of water and wind. Tropical storms – including hurricanes and typhoons – are spawned when enormous volumes of warm water vapor rapidly rise from the ocean surface. This movement can occasionally create hot towers, enormous pillar-like clouds rotating around the vortex’s eye wall. As the warm water vapor is drawn upward it cools into a mixture of super-cooled water, ice crystals and hail-like graupel. The energy water vapor releases as it cools and forms these particles fuels a hurricane’s ferocious convective winds – and lightning. When these various forms of water collide, there’s a tiny electrical charge transfer. And when they separate they fall at different rates, producing charge separation. With enough watery collisions, the charge separation builds until it produces a pulse of lighting. Thus the more energy release and convection, the more lightning, particularly intra-cloud lightning within the hurricane’s eye wall. To test this theory, Reisner and colleagues at LANL spent months developing a lightning model that they’ve integrated into HIGRAD, one of the lab’s leading-edge fluid-dynamics models. 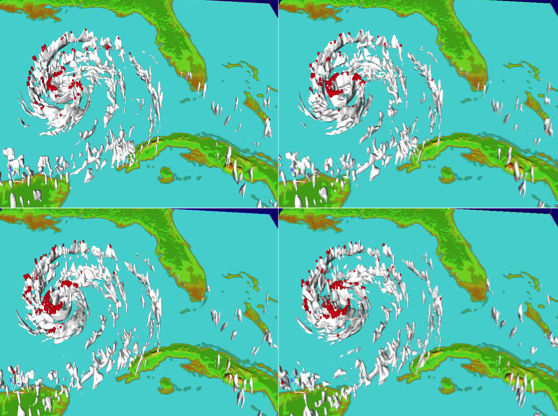 Coupled to a cloud model, the simulation is as close as anyone’s gotten to mimicking lightning observed in a real hurricane. Recently, Reisner released results of two intensive comparisons of the HIGRAD model with data on electrical activity from Hurricane Rita (2005) and dual-Doppler radar data from Hurricane Guillermo (1997). Researchers amassed some of the most detailed field data ever from both storms by using storm-chasing planes and ground-based lightning detection networks, including the Los Alamos Sferic Array.